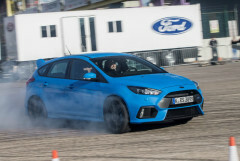 Ford Focus RS was the most expected model of the year, for most fans of the blue oval this car arouse the admiration of new design, driving properties and sport driving modes. Unfortunately, not everybody is satisfied with functionality of this model with the Rally Sport emblem. When Ford introduced the Focus RS to Australian market it encountered a problem with the local authorities, the media and the public. These groups suggest that vehicle equipped with the Drift Mode jeopardizes road safety. So-called security experts concluded that the car to daytime running with this functionality is completely unnecessary. Last time Ford Australia had to give up the Line Lock function, which allows to peel out. According to the Australian traffic law, burnout and drifting is prohibited. The penalty for such offenses is loss of license for a period from 6 to 12 months, in addition police has the ability to confiscate your vehicle.